These Bavarian pretzels are a very popular snack in Germany and perfect for your next Oktoberfest party! They taste delicious dipped in cheese sauce and are easy to make at home with simple ingredients. 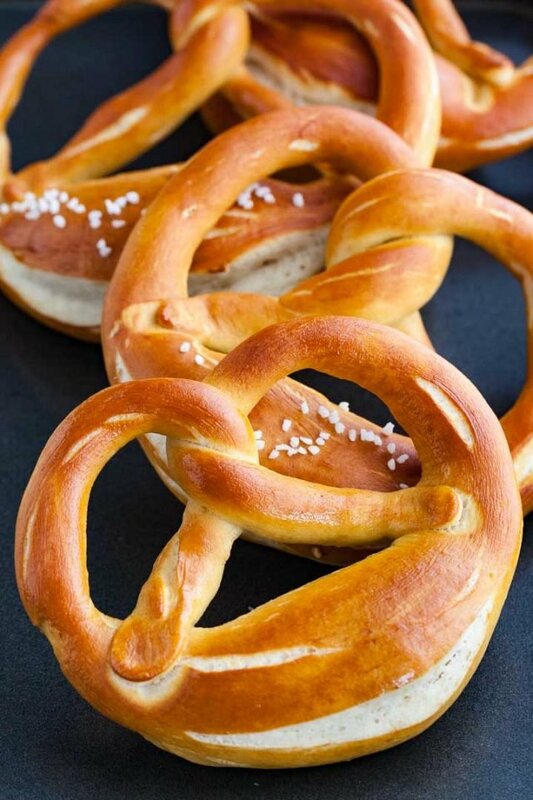 This authentic German Pretzel Recipe makes enough for a crowd as an appetizer. Pretzels are probably one of the most famous German baked goods! 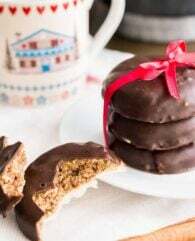 Making them at home is much easier than it seems if you follow my tips and tricks. They make a great snack with a layer of butter but also taste great the American-way dipped in cheese sauce or mustard! 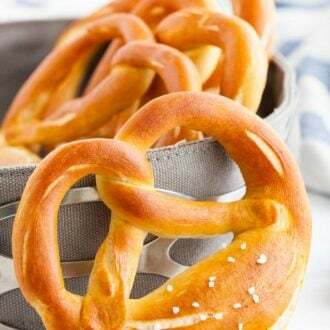 German soft pretzels, called Brezeln or Brezen in Germany, are soft inside with a bread-like chewy texture and have a deep brown outside that comes from bathing in a lye or baking soda solution before baking. Bakeries use lye but using it at home can be dangerous because it burns skin and eyes so baking soda is a much safer way to achieve nearly the same results without the risk. Homemade pretzels are so easy to make from scratch and taste like from your favorite German bakery. 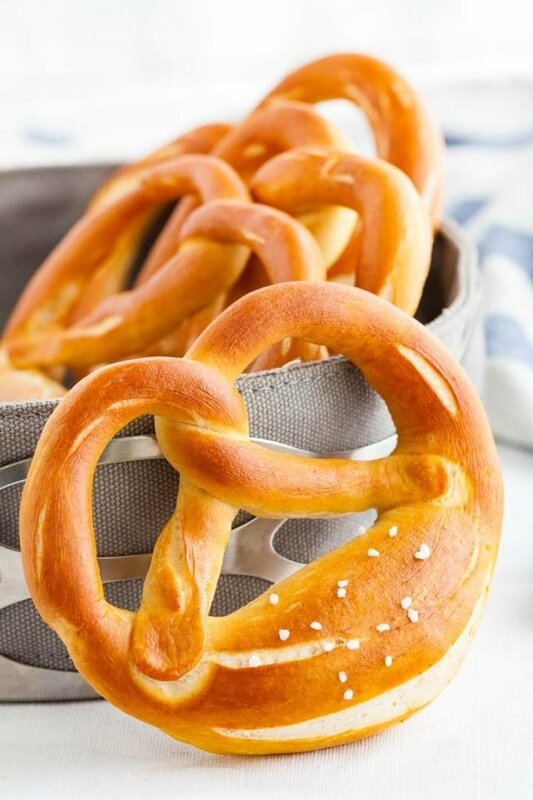 The dough is a simple yeast dough, that is shaped into pretzels, dipped into lye or baking soda, sprinkled with salt and baked to a golden brown. German pretzels are shaped a little bit different than American soft pretzels. The middle part is thicker and the ends thin out so that you have a really defined pretzel shape with three holes that doesn’t bake up into a big shapeless bun. 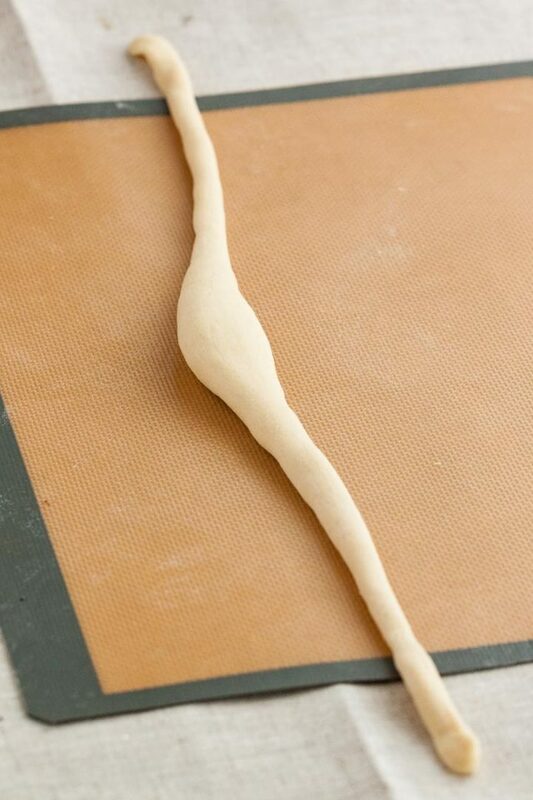 Start with a piece of dough and use your hands to roll it into a 16-inch long rope. 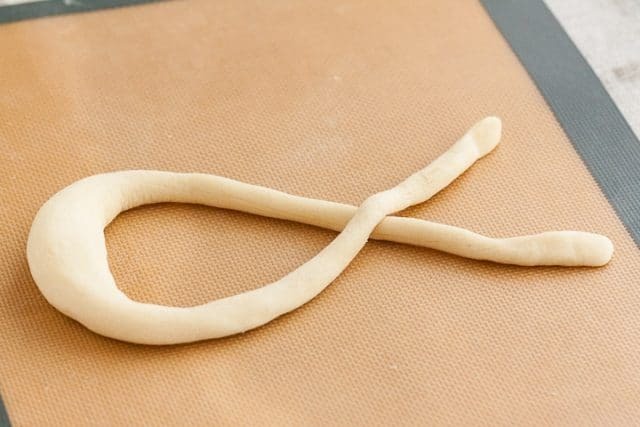 The middle part should bulge to a diameter of about 1.2 inches (3 cm) and the ends should be thinned out to about 0.3 inches (0.75 cm) to get the perfect pretzel shape. Next step is to bring the ends together to form a circle and then twist them. And then fold them over and secure the ends on the bottom curve. Just press them into the dough. 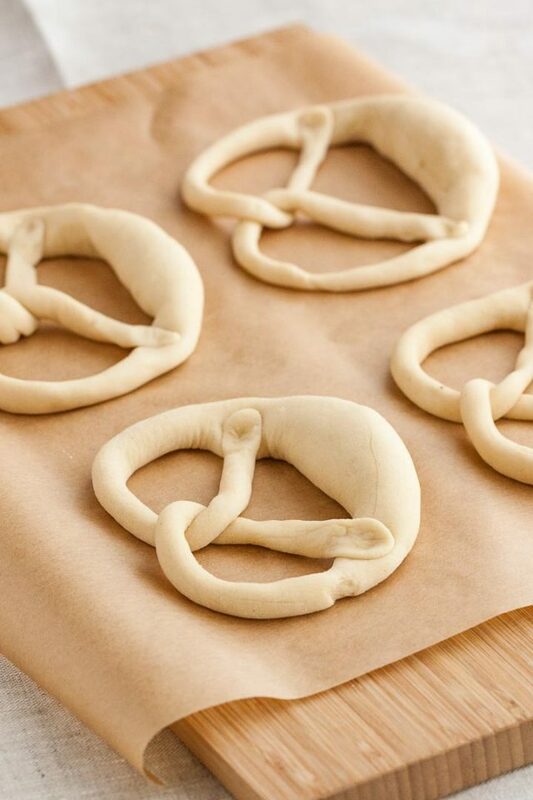 Transfer the shaped pretzels to a sheet of parchment paper and readjust the shape so they look like in the photo below. Let them rise for about 30 minutes in a warm place but don’t cover them! You want the surface of the dough to dry out to get the perfect texture and prevent it from soaking up the baking soda (or lye) wash. When the pretzels have risen place them next to an opened window or outside for a few minutes so the surface dries out even more because of the breeze. You can also use a fan to achieve the same result. Now comes the step which gives the pretzels their famous brown look. Bakeries use a lye solution for this but working with lye is a bit dangerous. You would need gloves, protective goggles, and try not to get the powder anywhere. Because of that I much prefer to use baking soda. It doesn’t work as effectively as lye and the pretzels will be a bit paler and not as shiny but in my opinion, they taste close enough to the original without the added risk. Following all the steps in my recipe will get you the same special texture authentic Bavarian pretzels have. That is also why my recipe uses part milk, part water. The milk helps to develop a browner surface. After dipping the pretzels into the water bath put them back on the parchment paper and sprinkle them with salt. I have to admit I hate salt on my pretzels so I only use it very sparingly or not at all. Before they go into the oven slash each pretzel with a sharp knife in the chunky middle part. 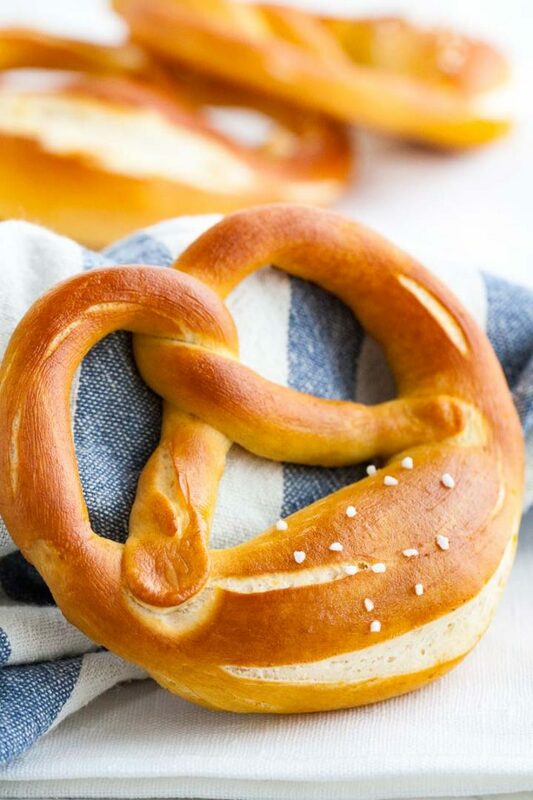 This gives them the real-deal bavarian pretzel look! In Germany, pretzels are often eaten as a quick snack. You can get them at every bakery and even at many service stations. Germans also love to eat their pretzels cut in half with a thick layer of butter and chopped chives on top. You have to try this combination! Pretzels are also served with a Weißwurstfrühstück. That’s a special breakfast that’s popular in Bavaria but especially in Munich. It consists of a kind of white sausage that is served with pretzels and sweet coarse mustard. Sounds a little bit gross but tastes so delicious! Not so fresh pretzels are also used as an ingredient for soup and pretzel dumplings. 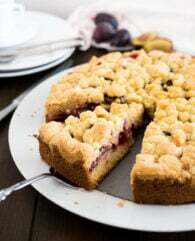 Looking for more German Recipes? Bavarian Beer Cheese Spread (Obatzda) – Tastes especially great with pretzels! Malt extract adds sweetness and flavor. 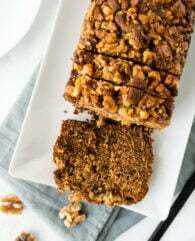 If you don’t have any on hand you can also use brown sugar to achieve a similar taste. This food-grade lye (Sodium Hydroxide) is traditionally used to make pretzels, but you have to be very careful when using it because it is dangerous (you can also use it as a drain cleaner). I prefer using baking soda even so the result is not as great (not as deeply colored) but the pretzels taste like the real deal without the danger. 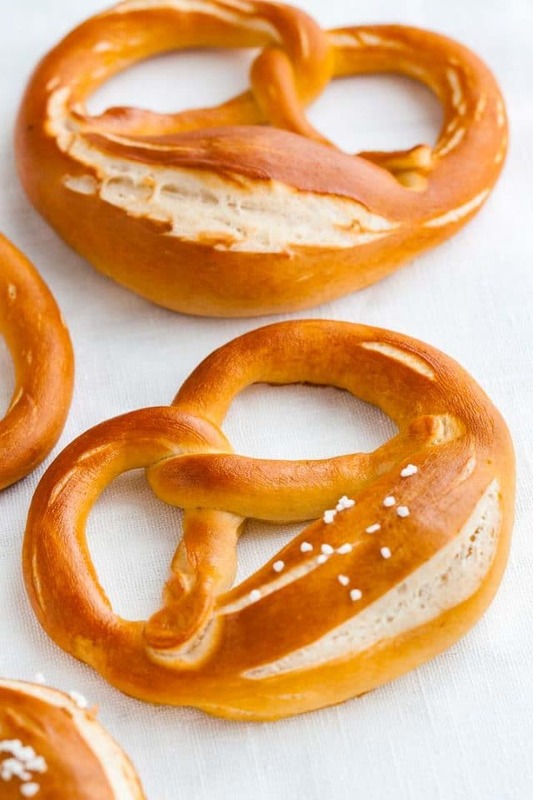 WANT TO TRY THIS BAVARIAN PRETZEL RECIPE? In the bowl of a stand mixer fitted with the dough hook attachment combine lukewarm milk, water, and brown sugar. Stir together with a fork then sprinkle active dry yeast on top. Give it a swirl with the fork and let sit for about 5 minutes until foamy. In the meantime melt the butter over low heat, then let cool for a few minutes. Add flour, melted butter, and salt to the bowl with the yeast and knead for 5 minutes until the dough is smooth and elastic. Cover bowl with plastic wrap put it in a warm place and let the dough rise until doubled (about 1 hour). Punch down the dough and divide it into 8 equally sized pieces. Roll each piece into a 16-inch (40cm) long rope, the middle part (about 2 inches or 5 cm) should be bulged to a diameter of about 1.2 inches and the ends should be thinned out to about 0.3 inches (0.75 cm). 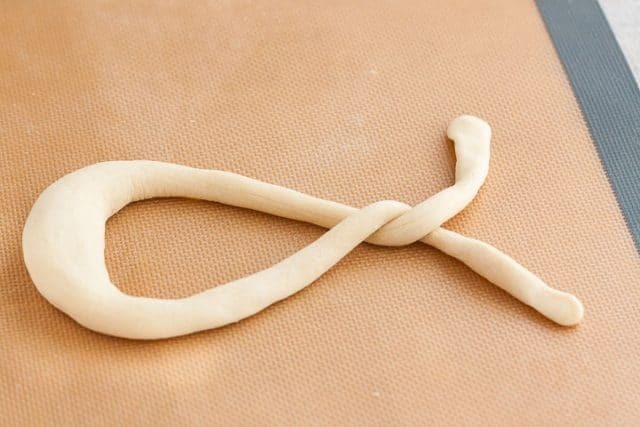 Bring the ends together so the dough forms a circle. Twist the ends together twice then fold them down onto the bottom curve. 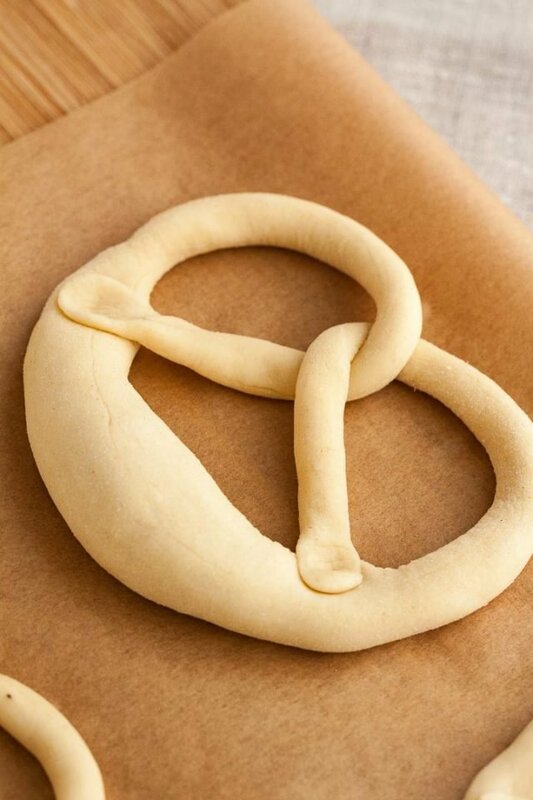 Press ends into the dough and shape into a perfect pretzel shape. Let the pretzels rise uncovered for 30 minutes in a warm place. In the meantime preheat the oven to 390°F (200°C) with a baking sheet inside in the lower third. Once the pretzels have risen, put them next to an opened window so the surface dries out and the pretzels develop a skin. This step is important for the texture. Bring 4 cups water in a medium pot to a boil then add the baking soda. With a slotted spoon dip the pretzels one at a time carefully into the simmering water. Take them out after about 5 seconds and place on a sheet of parchment paper. Sprinkle with a little bit of salt and cut the dough with a sharp knife about 0.2 inches deep in the thick middle part at the top-back. Transfer the parchment paper with the pretzels onto the hot baking sheet in the oven and bake for 18-20 minutes until nicely browned. You want them to be really brown and not golden. Remove pretzels from the oven and let cool on a wire rack. If you want them to be shiny brush them with a little bit of melted butter. These were delicious! I need to make these for a party. Can I freeze the dough? If so, at what stage would I do that? They are perfect! My kids don’t like sweets anymore, so this is the perfect snack for them. They were fairly easy to do and if you can get your kids help in rolling them out, it can go quickly. I looked at several pretzel recipes and yours seemed the best one to try. Especially since it’s a German recipe. I will say though, when looking for pretzel recipes, your took awhile before I came upon it. Fantastic recipe! Absolutely delicious pretzels! Thank you! These tasted like the ones we’ve tried in Germany! Well worth the effort!! Your instructions on how to twist them the right way were very helpful. Thank you! Delicious!! It reminds me of the ones my Oma made!